15 Month Shots: What Should I Expect? The 15 month shots are administered during a routine checkup. However, the shots may vary depending on the pediatrician. You can generally expect for your child to receive Hep A/B, DTaP, Hib, PCF, IPV, influenza, MMR, and varicella. (The Pentacel vaccine may be used as a replacement for some of these vaccines, to help minimise the number of injections your baby receives; ask your pediatrician about it.) 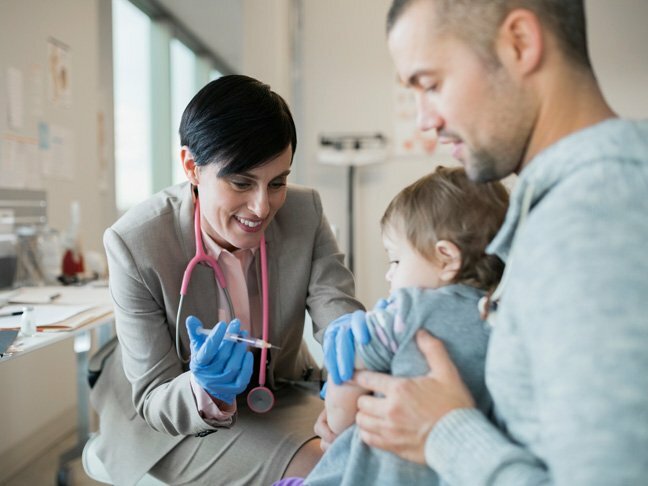 Before you go to your child’s 15-month check-up, it’s helpful to know what the immunizations will help protect your baby against, as well as any possible side effects. What are HepB and HepA? Hepatitis A/B vaccinations should be given to a child at three intervals. Babies are given a shot at birth, between the ages of 2 to 4 months of age, and around 15 months. Hep A/B is a terrible condition that attacks the liver. Watch for anything out of the ordinary after the shot is administered. Fevers, rashes, and any other unusual symptoms should be reported to your child’s pediatrician. Infants with weakened immune systems or born prematurely are more susceptible to Hep A/B. This vaccination is for diphtheria, tetanus, and pertussis. Diphtheria is a respiratory condition. Tetanus is lockjaw caused by bacteria found in soil, and pertussis is a form of whooping cough. Even though a child is fully vaccinated, they will need these updated every 10 years. They should receive five doses at ages 2, 4, 6 and 15 to 18 months. The last dose is between 4- and 6-years-old. If any side effects present after the initial doses, including constant crying up to three hours of the shot and a fever of 105 degrees F, consult your pediatrician. The Hib vaccine is to protect against Haemophilus influenza. Two or three doses are given before a child is 6 years of age. Pain at the injection site is common as is a low-grade fever. However, this vaccination is well-tolerated. IPV is a vaccination against polio that is given in the arm or the leg. It is given at four stages: ages 2, 4, and 6 to 18 months. Another booster dose is given between 4 and 6 years of age. Any child who had a reaction previously or is allergic to the antibiotics streptomycin or polymyxin B should not take this vaccination. Does my child need an influenza shot? Influenza A and B are stopped with this vaccination. Though many people feel it is unnecessary, the flu can easily kill small children. The shot may make a child lethargic for a few days, but new formulas come with little to no side effects. The MMR vaccine helps protect again against German measles. The live attenuated viruses of the three diseases are mixed and injected. This vaccine will also protect against measles, mumps, and rubella. Side effects can include sore arm from the injection, fever, rash, and joint pain. Varicella helps to protect a child from chicken pox, which is caused by the varicella-zoster virus. It is made from live but weakened parts of the virus. The first dose is given at around 15 months of age. The only side effects reported are pain at the injection site and a mild rash. Knowing what shots your child needs, the possible side effects, and the necessity of each of these vaccinations is important. Arm yourself with knowledge so that you can take appropriate action if something unforeseen should happen. What Are The Side Effects Of The Rotavirus Vaccine?Does My Baby Have Tongue Tie?